When you’re on a diet, it’s inevitable – you’re going to get hit with a craving. When you do, you have a few choices. You can deny your craving. You can give in to your craving with a meal that completely throws you off track. Or you can find a way to satisfy your craving with something that isn’t all bad. To set yourself up for success and make sure you’re always strong enough to choose the last option, you can start saving recipes like this one. These chocolate & pretzel protein truffles are sweet enough to curb your sweet tooth craving, but contain protein to help you with your muscle building, weight loss and/or performance goals! Although we wouldn’t recommend replacing all of your protein shakes with a treat like the truffles, they are definitely a smarter alternative to meal that contains zero beneficial macros at all. 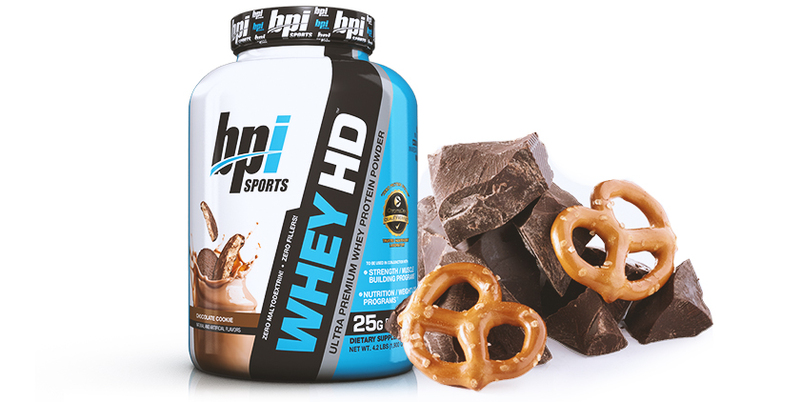 In a bowl, combine the Whey HD™, ground hazelnuts, chopped pretzels, chocolate spread and milk. Mix into a dough. If it is too sticky, add more of the ground nuts to dry it up. If it is too dry, add a bit more milk. Line a cookie sheet or baking pan with parchment paper. Melt the dark chocolate and use it to coat the protein balls. Top with a tiny pretzel. Set the finished protein truffles on the parchment paper. Refrigerate until the chocolate sets, about one hour. Testing out the recipe today? Take a picture, tag us on social and let us know what you think!